South Dakota’s own GRAMMY-nominated professional chorus returns to the area for concerts featuring music from the rich choral traditions of the Baltic states. 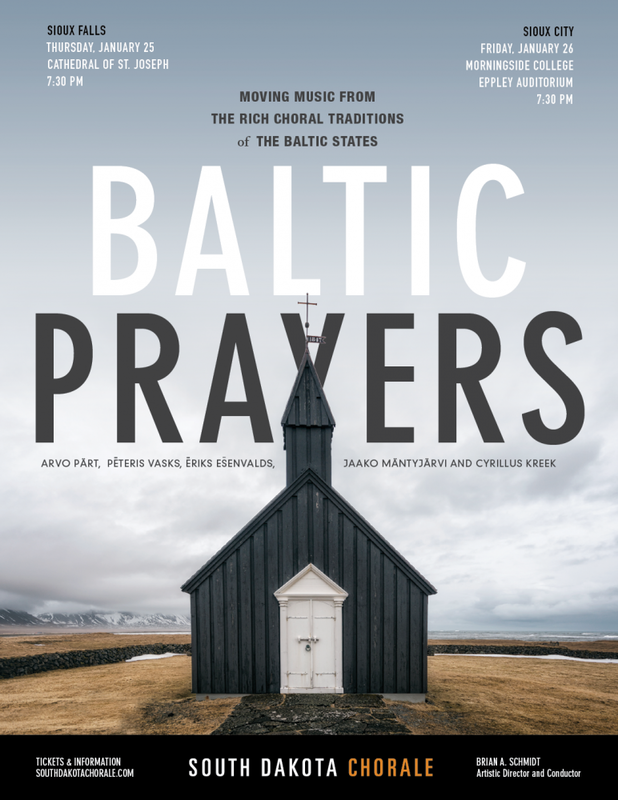 Baltic Prayers includes works by Arvo Pärt, Eriks Esenvalds, and Carl Nielsen. From a Requiem setting to commemorate the lives lost in a tragic Estonian shipwreck to a stunning musical setting of a common prayer by Mother Teresa, this music is deeply reflective and spiritually healing. Baltic Prayers will be presented Thursday, January 25 at 7:30 p.m. at St. Joseph Cathedral in Sioux Falls. Tickets are available online at www.southdakotachorale.com or at the door. The concert will be presented Friday, January 26 at 7:30 p.m. at Eppley Auditorium at Morningside College in Sioux City, Iowa. There is no admission charge for this concert. In its ninth season, the South Dakota Chorale is an ensemble whose mission is to provide professional singing opportunities to local and regional musicians, and to connect them with other professionals from around the country. In the process, audiences in South Dakota and beyond have the opportunity to experience music and sound that isn’t otherwise heard. The chorus, under the direction of SDSU graduate and current Baylor University conductor Brian Schmidt, is comprised of roughly fifty percent local and regional singers, with others travelling from around the US and Canada to participate. The travelers have come to love their time in Sioux Falls and look forward to returning to experience our hospitality and appreciative audiences. The South Dakota Chorale has presented a wide range of choral repertoire, from Bach to Dolly Parton in concerts in our region. Baltic Prayers, the theme for the upcoming concerts, explores the rich Eastern European Choral Tradition and some of its most notable composers. The South Dakota Chorale has released three recordings which have all received critical acclaim. The latest recording, Tyberg Masses, has been nominated for four GRAMMY awards this year. Notable national appearances include concerts at Duke University, Iowa Choral Directors Conference and the 2015 American Choral Directors Association Conference in Salt Lake City. For more information about The South Dakota Chorale, please visit www.southdakotachorale.com or contact Jack Mohlenhoff, Executive Director at jmohlenhoff@firstcongucc.com or 605.359.1058.